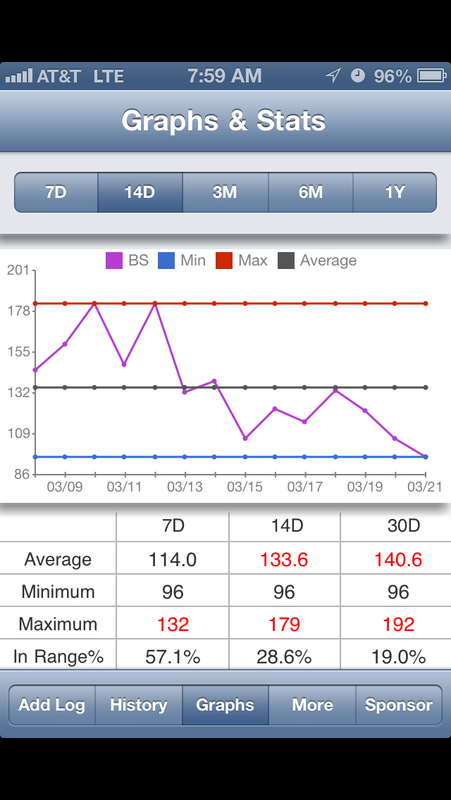 My blood sugar readings from the iPhone app called BloodSugar. Click to enlarge. Ten days ago I started a new eating plan. I am eating very low carb for eight weeks in the attempt to lower my blood sugar and get off the insulin shots and diabetes (type 2) medication (Metformin) that I take. I have been on Metformin for over eight years and the insulin shots were started after last summers’ hospital stay for Acute Pancreatitis. Ruthie has started a new venture – a company called Diabetes Free DFW. She and her business partner, Deneice Scott, are holding classes, once a week for 16 weeks to educate participants about how nutrition can help them take charge of their own health and beat diabetes the natural way. The classes teach a method called The Diabetes Free Zone System. 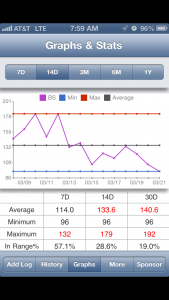 The image shows my daily morning fasting blood sugars for the last 14 days. This morning it was 96. I have not seen a 96 since before June 11, 2012 when I went into the hospital. I am very pleased with my progress on this plan. If my readings stay under 100 for three days, my doctor says to reduce the insulin by five units. If it continues to stay low, I can lower it five units until I am off the insulin. This stage of the plan is eight weeks trying to hold to 60 carbs or less daily. So far, I have managed to be under 60 once, but have been close a few days. The first few days I kept thinking “no way am I going to go a whole day under 60 carbs,” but it actually is possible. I have been keeping track of my daily food intake with an iPhone app called MyFitnessPal. It is intended to be a calorie tracker, but it also tracks carbs and that is what I am paying attention to. I have also lost 6-1/2 pounds in the last 10 days, but that is not my primary goal – getting off the diabetes medications is the primary goal. I’ll try and post updates as often as I can. A big challenge coming up is the Jewish holiday of Passover. It’s not the week of not eating bread that is the challenge, but the two traditional meals with big Jewish families that I will have to negotiate carefully to stay on track. I urge anyone wanting to rid themselves of the complications and medications of diabetes to look into taking these classes. i am learning so much about eating right and nutrition at each class. Very proud of you Dennis! Don’t worry, the 4 of us will get through Passover together. At night is it dark or light? (required) Why ask? Wow, we actually got some snow! Honey, the picture of Bart is done! 3 days till our cruise on Carnival Ecstasy! How in the world can you stuff this many Xmas lights on one house?